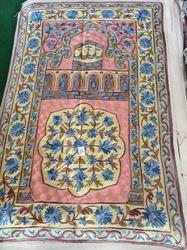 we offer you hand made Muslim prayer rugs made by best artisans of Kashmir in Kaba and medina designs,floral designs and in Meharab designs in standard sizes. Customized designs and size can also be possible. 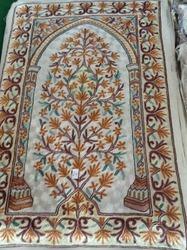 The range of Hand Made Payer rug from Kashmir are offered by us in innovative designs, intricate patterns and fast colors. Fabricated using good quality yarn, the range is embroidered by using stones and beads. We have decades of experience and expertise in supplying a large quality of highly standard Hand Made Payer rugs from Kashmir . They are fabricated with standard thread procured from reliable and authorized vendors. 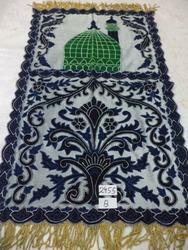 A wide range of Hand Made Prayer rug offered by us is the perfect blend of silk and Pashmina wool. Finely done hand embroidery in ravishing designs with multi-color threads carries a traditional look. 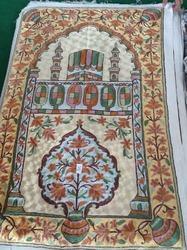 We have decades of experience and expertise in supplying a large quality of highly standard Payer Rugs from Kashmir . They are fabricated with standard thread procured from reliable and authorized vendors. 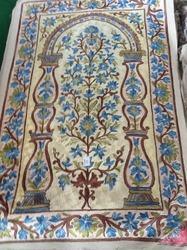 We offer a gamut of Payer Rug from Kashmir that are the combination of creativity combined with elegance. The range is highly demanded for different kind of embroidery and cut work, which give it an exotic look. 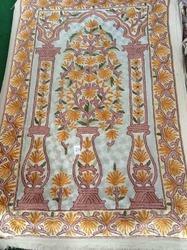 We offer an exclusive range of Payer Rugs fabricated from quality silk using innovative designs and elegant patterns. We have decades of experience and expertise in supplying a large quality of highly standard Payer Rug . They are fabricated with standard thread procured from reliable and authorized vendors. 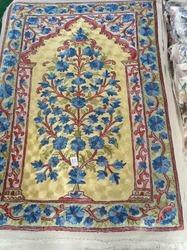 We have decades of experience and expertise in supplying a large quality of highly standard Kashmiri Hand Made Payer Rug . They are fabricated with standard thread procured from reliable and authorised vendors. We have decades of experience and expertise in supplying a large quality of highly standard Hand Made Payer rugs from Kashmir . They are fabricated with standard thread procured from reliable and authorised vendors. 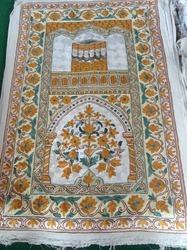 We are engaged in offering an exclusive range of Designer Pray Rugs, which is made using premium quality raw material. All our rugs are durable and have been designed by experts keeping in mind the current fashion trends. 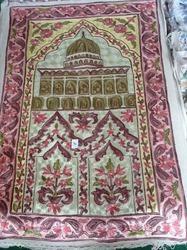 We have installed various machines in our unit for the production of rugs as per the desired shapes, sizes and designs. 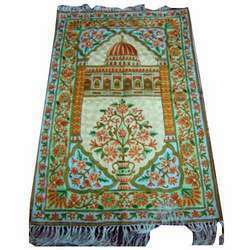 We are offering our clients with Woolen Pray Rug that is perfect for the winter season. These rugs are used to keep the decor warm as well as cozy. Our skilled artisans weave these from quality wool and offer these in different striking designs. Reflecting the traditional weaving work of Kashmir, these woolen rugs are available in different sizes and shapes. 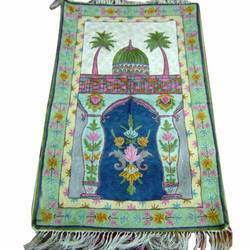 We are offering a wide collection of Cotton Pray Rugs that have gained huge repute in the market for their excellent design and texture and offer a comfortable place for praying. These rugs can also be made using luxurious long pile 100% cotton. We also have the ability to customize our range as per customers requirement. 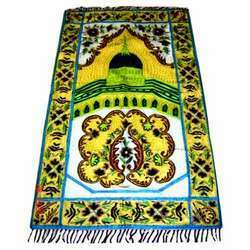 We are engaged in offering Golden Work Pray Rugs that are available in variety of sizes, styles and colors. Made using quality material, our array of rugs exemplifies modern & traditional rug weaving techniques of India. Moreover, we can also customize these as per the requirement of our clients. Backed by a team of skilled artisans, we are offering artistically rich woven Silk Velvet Pray Rug that is offered with various modern designs and patterns with the most updated colors and styles. Both hand crafted and machine made rugs can be availed from us at best of industry rates. Moreover, these are available in standard as well as customized sizes. 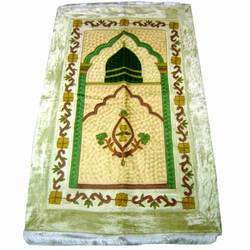 We are offering well designed and alluring range of Embroidered Pray Rugs that has mesmerizing designs that are made by our skilled artisans. The entire base cloth is covered with embroidery. We can offer different embroidery designs according to the clients provided specifications.